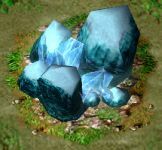 Unique frost tower with strong slowing abilities. Each creep damaged by this tower ' s attacks has a 25% chance to get slowed by 27% for 4 seconds and a 5% chance to get stunned for 1.5 seconds. With his 15 years he is really young, but 15 years in the ice hell of Northrend is something to show. Summons 5 waves of icy spikes which fall down to earth. Each wave deals 60 damage in an AoE of 200. 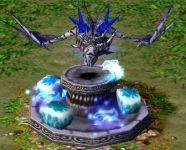 Each time a unit is damaged by this spell there is a chance of 30% to slow the unit by 7% for 4 seconds and a chance of 10% to stun the unit for 0.25 seconds. Summons 6 waves of icy spikes which fall down to earth. Each wave deals 333 damage in an AoE of 300. Each time a unit is damaged by this spell there is a chance of 35% to slow the unit by 9% for 4.5 seconds and a chance of 15% to stun the unit for 0.50 seconds. His father said to him: Stay cool. Summons 7 waves of icy spikes which fall down to earth. Each wave deals 572 damage in an AoE of 400. Each time a unit is damaged by this spell there is a chance of 40% to slow the unit by 11% for 5 seconds and a chance of 20% to stun the unit for 0.75 seconds. His father said to him: Stay cool. And he did. Summons 8 waves of icy spikes which fall down to earth. Each wave deals 1000 damage in an AoE of 500. Each time a unit is damaged by this spell there is a chance of 45% to slow the unit by 14% for 5.5 seconds and a chance of 25% to stun the unit for 1 seconds.